A recap of the The 2014 Classics of the Sky Tauranga City Air Show. Lifes a "Beech" according to Murray Kirkus who spent time with a Phillipines based Beech operator specialising in Fish delivery. Richard Greaney takes us on a journey from original methods of aircraft tracking to internet tracking. 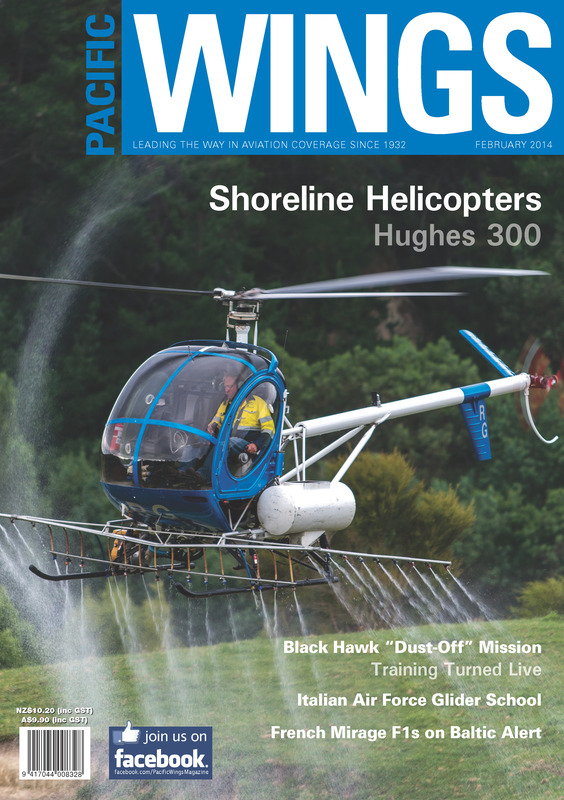 Rob Neil reports on locally based Shoreline Helicopters and its versatile Hughes 300. A Photo assignment with the 377th Medical Company (Air Ambulance) goes from training to live in an instance. A selection of some of the Helicopters on display at the PIMA Air and Space Museum in Arizona. Erik Roelofs takes Pacific Wings readers on a backstage pass to the operations of the Italian Air Force Glider School. Paul Sortehaug continues his series with a report on WGCDR Alan Christopher Deere. John Parker attended the Great Eastern Fly-in at Evans Head in NSW and reports on the activities.